In the hours it took for us to walk back home from a house party, he didn’t shut up about the moon. His hatred seemed mundane, but it was also genuine and visceral, even if he’d attributed it to drunkenness. The Twitter exchange mirrored an incident that took place in 2017, when a Facebook post about blowing up the moon went viral. 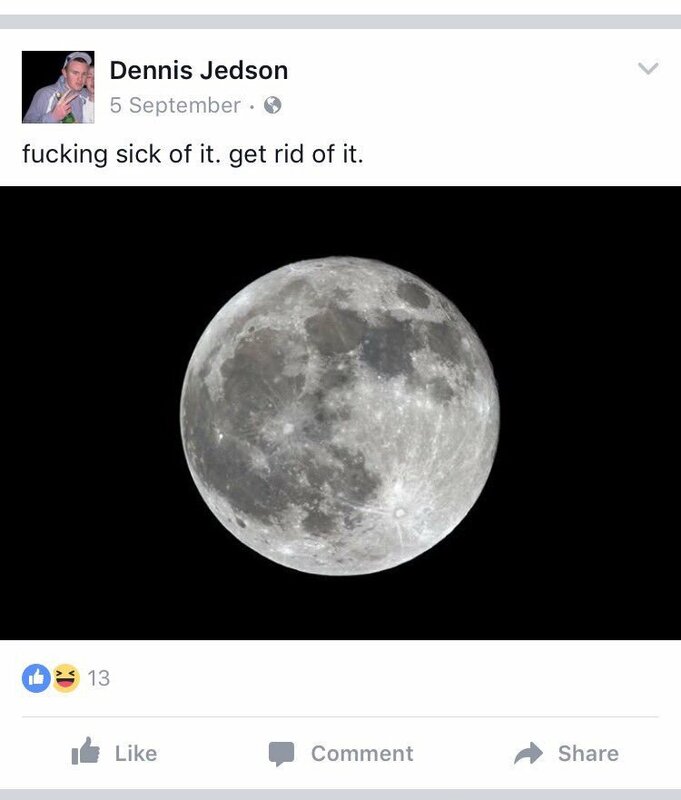 Dennis Jedson — allegedly from the U.K. (although no one is sure if he actually exists) — wrote about wanting to “get rid of the moon,” even going as far as to suggest that we place nuclear waste onto its surface in order to melt it. The post was tweeted out by the U.K.-based @criwank, and has since been retweeted more than 38,000 times; Jedsen even appeared on Esquire U.K.’s Angriest Men of 2017 list. i look up at the moon, looking all smug and self-satisfied, and i think "ugh"
Takes credit for being bright, but it's just reflecting other people's light. There are so many things more miraculous than that dead rock hanging in the sky like an overgrown clock. But that disregards the longer history of male fear toward the moon. “There’s a secret history of the moon, a long tradition in which Earth’s largest satellite has been viewed as an object of fear, hate and distrust,” reads a 2017 Atlantic piece. It goes on to describe the Malleus Maleficarum, also known as the “Hammer of Witches,” the Catholic treatise used to justify the burning and drowning of suspected “witches” whose powers the priests believed to be “deeply affected by certain phases of the moon.” Meanwhile, during the Crusades, Pope Urban II, who called on the “lands of Christendom” to go to war against the “Muslim Saracens,” frequently referred to Allah as the “Pagan Lunar God,” in contrast to the “Solar deity” that Christ was often represented by. In literature, no writer was more fearful and disgusted by the moon than H.P. Lovecraft. “I hate the moon — I am afraid of it — for when it shines on certain scenes familiar and loved it sometimes makes them unfamiliar and hideous,” he writes in the opening of his 1922 short story “What the Moon Brings.” The story details one of Lovecraft’s nightmares in which he drowns in the sea in order to escape flesh-eating creatures encouraged by the “horrors of the evil, hateful moon.” Similarly, in The Dream Cycle, a collection of Lovecraft stories about an alternate reality, shapeless, expressionless beings “without any eyes, but with a curious vibrating mass of short pink tentacles on the end of its blunt, vague snout” live on the moon. If Lovecraft’s vision of the moon was that of a terrifying, unforgiving object that punished man, the Space Race demonstrated how man was willing to destroy himself in order to tame it. That is, in 1958, both the U.S. and Soviet Union developed secret plans to fire nuclear weapons at the moon, as they felt threatened that the other would attempt to colonize it, especially once the Soviet Union had successfully launched Sputnik in 1957. “He who controls the Moon, controls the Earth,” U.S. Air Force Brigadier General Homer A. Boushey told the Aero Club in Washington a year later. And if the U.S. couldn’t have it, no one could. As such, U.S. army chiefs allegedly developed “Project A119,” a plan to launch an atom bomb 238,000 miles to the moon, where it would detonate upon impact. The plan — which to this day the U.S. government has never officially confirmed — didn’t ever really get past the idea phase, but that hasn’t stopped conspiracy theorists from speculating as to whether the technology could still work. Nor has it stopped communities on sites like Quora or Yahoo! Answers from wondering how one would go about blowing up the moon anyway. In fact, this question is so popular that Gizmodo ended up crunching the numbers, finding that you’d need 9,000 atomic bombs of the 15,000-kiloton “Castle Bravo” class to obliterate the moon’s entire surface. For the moment, though, it seems like we can hold our fire. But that doesn’t mean conquering the moon is off the table. Last April, for example, the Chinese government announced plans to invest into its space program, laying out ambitious plans to build a “lunar colony.” Not to be outdone, India is currently trying to decide whether it should redirect its space program resources from Mars to the moon, while companies like Virgin are proposing exclusive trips to the moon’s surface for the world’s richest people, with the aim of building luxury accomodation on its surface. Essentially, we’ve chosen hostile takeover over outright destruction — at least for now.